have many paddle holsters to choose from. The 268A FlatSider XR19 holster from Aker is designed for security and comfort. The entire holster pocket sits on the outside of the paddle, allowing the body side to be completely flat for comfortable long-term wear. The Air-Flo paddle design improves breathability as well, perfect for hot days, and includes dual retention barbs to prevent it from moving around as you walk for maximum concealability. The holster provides a quick draw as well thanks to its open top design. The adjustable tension screw allows you to set the perfect balance of security and access, and doubles as a trigger guard stop. The holster pocket includes a full-length sight channel and a dual-plane muzzle that fits standard and shortened barrels for compatibility with a wide range of firearms. The premium leather construction makes it extremely tough and allows it to mold to your body over time. Good quality but sags just a bit. 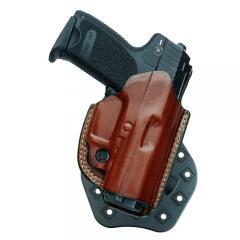 Great holster, carries well easy to remove and attach from body and holds gun solid in place. I have one of these for all my carry guns, a fantastic holster I highly recommend. Well made and hugs the body. Gun fits snug in the holster. Well formed for specified handgun. Quality construction. Nice holster and a good value. First non-fobus paddle I've used and I am pleasantly surprised. Can't brag enough on this one Excellent fitmaterialsconstruction. Tucks-in good and close to the body. Bought this brandmodel because my go-to Fobus does NOT (to date) make a paddle holster for the .40 Sig P229 wrail. Was sufficiently impressed that I also chose to order the Aker Flatsider shoulder rig for the same pistol rather than my normal go-to-favorite-for-30-years Galco Miami Classic. I looked and looked for that perfect Holster for the GLOCK 27 Subcompact. The AKER is extremely well made, and detail. This Holster is gonna be around for a long time. I'm able to wear it while on my Harley with no worries . At the range a shooter asked to see it and his GLOCK 9 full-size fit perfectly too. The barrel is exposed , but fit surprisingly. Cops Pluse without question has the lowest prices on the highest end Holstersaccess. Aker Delivers once again, in my opinion on of the finest holster makers out there without going full custom. Awesome 1911 holster. An excellent (Paddle) concealment holster. I like the retention adjustability, and the quick on & off. It 'wears' tight against your body. I have three (3) of these for various handguns and enjoy and trust each of them. Well made, comfortable. Very little break-in needed. I have a 1st gen (original) Glock model 20, 10mm, bought it in 1989. Will this holster fit my pistol? Yes, it will fit the Glock 20 Gen 1. I bought a S&W M&P Shield .40 Do I use the compact holster or just the .40 one? The shield is smaller than the compact. Holster was not designed for the shield. It should still hold the gun but will not be as deep and secure due to the smaller slide and barrel. In this video we show you how to break-in your new leather holster.